Cabin Steward Anka was awesome, everything worked and was in it&apos;s appropriate place. The website does not do justice to the cabin. 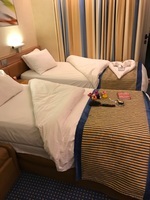 On Carnival&apos;s website, the layout shows only the twin beds in a queen configuration but no sofa or mini fridge. The cabin had both of these amenities. I already wrote about this in the review. Loved the aft-balcony! Spent many relaxing hours reading a book or watching a movie and then I would get distracted by the sunset or other amazing views.